Air pollution from motor vehicles is an example of a negative externality. The costs of the air pollution for the rest of society is not compensated for by either the producers or users of motorized transport. In economics, an externality is the cost or benefit that affects a party who did not choose to incur that cost or benefit. Economists often urge governments to adopt policies that "internalize" an externality, so that costs and benefits will affect mainly parties who choose to incur them. Two British economists are credited with having initiated the formal study of externalities, or "spillover effects": Henry Sidgwick (1838-1900) is credited with first articulating, and Arthur C. Pigou (1877-1959) is credited with formalizing the concept of externalities. where is the type vector without its -th component. Intuitively, the first term is the hypothetical total payoff for all agents given that agent does not exist, and the second (subtracted) term is the actual total payoff for all agents given that agent does exist. On the other hand, a positive externality would increase the utility of third parties at no cost to them. Since collective societal welfare is improved, but the providers have no way of monetizing the benefit, less of the good will be produced than would be optimal for society as a whole. Goods with positive externalities include education (believed to increase societal productivity and well-being; but controversial, as these benefits are generally internalized, e.g., in the form of higher wages), public health initiatives (which may reduce the health risks and costs for third parties for such things as transmittable diseases) and law enforcement. Positive externalities are often associated with the free rider problem. For example, individuals who are vaccinated reduce the risk of contracting the relevant disease for all others around them, and at high levels of vaccination, society may receive large health and welfare benefits; but any one individual can refuse vaccination, still avoiding the disease by "free riding" on the costs borne by others. There are a number of potential means of improving overall social utility when externalities are involved. The market-driven approach to correcting externalities is to "internalize" third party costs and benefits, for example, by requiring a polluter to repair any damage caused. But, in many cases internalizing costs or benefits is not feasible, especially if the true monetary values cannot be determined. Laissez-faire economists such as Friedrich Hayek and Milton Friedman sometimes refer to externalities as "neighborhood effects" or "spillovers", although externalities are not necessarily minor or localized. Similarly, Ludwig von Mises argues that externalities arise from lack of "clear personal property definition." 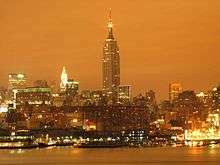 Light pollution is an example of an externality because the consumption of street lighting has an effect on bystanders that is not compensated for by the consumers of the lighting. Many negative externalities are related to the environmental consequences of production and use. The article on environmental economics also addresses externalities and how they may be addressed in the context of environmental issues. Air pollution from burning fossil fuels. This activity causes damages to crops, (historic) buildings and public health. Anthropogenic climate change as a consequence of greenhouse gas emissions from burning oil, gas, and coal. The Stern Review on the Economics Of Climate Change says "Climate change presents a unique challenge for economics: it is the greatest example of market failure we have ever seen." Water pollution by industries that adds effluent, which harms plants, animals, and humans. Noise pollution during the production process, which may be mentally and psychologically disruptive. Systemic risk: the risks to the overall economy arising from the risks that the banking system takes. A condition of moral hazard can occur in the absence of well-designed banking regulation, or in the presence of badly designed regulation. Negative effects of Industrial farm animal production, including "the increase in the pool of antibiotic-resistant bacteria because of the overuse of antibiotics; air quality problems; the contamination of rivers, streams, and coastal waters with concentrated animal waste; animal welfare problems, mainly as a result of the extremely close quarters in which the animals are housed." The depletion of the stock of fish in the ocean due to overfishing. This is an example of a common property resource, which is vulnerable to the Tragedy of the commons in the absence of appropriate environmental governance. In the United States, the cost of storing nuclear waste from nuclear plants for more than 1,000 years (over 100,000 for some types of nuclear waste) is, in principle, included in the cost of the electricity the plant produces in the form of a fee paid to the government and held in the nuclear waste superfund, although much of that fund was spent on Yucca Mountain without producing a solution. Conversely, the costs of managing the long term risks of disposal of chemicals, which may remain hazardous on similar time scales, is not commonly internalized in prices. The USEPA regulates chemicals for periods ranging from 100 years to a maximum of 10,000 years. Sleep deprivation due to a neighbor listening to loud music late at night. Antibiotic resistance, caused by increased usage of antibiotics. Individuals do not consider this efficacy cost when making usage decisions. Government policies proposed to preserve future antibiotic effectiveness include educational campaigns, regulation, Pigouvian taxes, and patents. Shared costs of declining health and vitality caused by smoking and/or alcohol abuse. Here, the "cost" is that of providing minimum social welfare. Economists more frequently attribute this problem to the category of moral hazards, the prospect that parties insulated from risk may behave differently from the way they would if they were fully exposed to the risk. For example, individuals with insurance against automobile theft may be less vigilant about locking their cars, because the negative consequences of automobile theft are (partially) borne by the insurance company. Higher congestion costs and increased accident risks when people use public roads. Consumption by one consumer causes prices to rise and therefore makes other consumers worse off, perhaps by reducing their consumption. These effects are sometimes called "pecuniary externalities" and are distinguished from "real externalities" or "technological externalities". Pecuniary externalities appear to be externalities, but occur within the market mechanism and are not considered to be a source of market failure or inefficiency, although they may still result in substantial harm to others. A positive externality (also called "external benefit" or "external economy" or "beneficial externality") is the positive effect an activity imposes on an unrelated third party. Similar to a negative externality, it can arise either on the production side, or on the consumption side. A beekeeper who keeps the bees for their honey. A side effect or externality associated with such activity is the pollination of surrounding crops by the bees. The value generated by the pollination may be more important than the value of the harvested honey. The construction and operation of an airport. This will benefit local businesses, because of the increased accessibility. An industrial company providing first aid classes for employees to increase on the job safety. This may also save lives outside the factory. An individual who maintains an attractive house may confer benefits to neighbors in the form of increased market values for their properties. Driving an electric vehicle charged by electricity from a renewable source, reducing greenhouse gas emissions and improving local air quality and public health. Although this may increase emissions from power plants burning fossil fuels, this is usually more than offset by reduced vehicle emissions, especially where hydroelectric, nuclear and renewable sources are prevalent. Increased education of individuals, as this can lead to broader society benefits in the form of greater economic productivity, a lower unemployment rate, greater household mobility and higher rates of political participation. An individual buying a product that is interconnected in a network (e.g., a smartphone). This will increase the usefulness of such phones to other people who have a video cellphone. When each new user of a product increases the value of the same product owned by others, the phenomenon is called a network externality or a network effect. Network externalities often have "tipping points" where, suddenly, the product reaches general acceptance and near-universal usage. In an area that does not have a public fire department, homeowners who purchase private fire protection services provide a positive externality to neighboring properties, which are less at risk of the protected neighbor's fire spreading to their (unprotected) house. The existence or management of externalities may give rise to political or legal conflicts. Collective solutions or public policies are sometimes implemented to regulate activities with positive or negative externalities. if some job candidates begin wearing expensive custom-tailored suits, a side effect of their action is that other candidates become less likely to make favorable impressions on interviewers. From any individual job seeker's point of view, the best response might be to match the higher expenditures of others, lest her chance s of landing the job fall. But this outcome may be inefficient, since when all spend more, each candidate's probability of success remains unchanged. All may agree that some form of collective restraint on expenditure would be useful." Frank notes that treating positional externalities like other externalities might lead to "intrusive economic and social regulation." He argues, however, that less intrusive and more efficient means of "limiting the costs of expenditure cascades"—i.e., the hypothesized increase in spending of middle-income families beyond their means "because of indirect effects associated with increased spending by top earners"—exist; one such method is the personal income tax. Inframarginal externalities are externalities in which there is no benefit or loss to the marginal consumer. In other words, people neither gain nor lose anything at the margin, but benefits and costs do exist for those consumers within the given inframarginal range. Technological externalities directly affect a firm's production and therefore, indirectly influence an individual's consumption; and the overall impact of society. The usual economic analysis of externalities can be illustrated using a standard supply and demand diagram if the externality can be valued in terms of money. 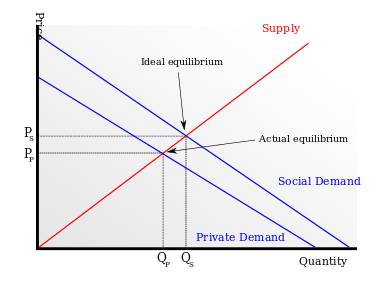 An extra supply or demand curve is added, as in the diagrams below. One of the curves is the private cost that consumers pay as individuals for additional quantities of the good, which in competitive markets, is the marginal private cost. The other curve is the true cost that society as a whole pays for production and consumption of increased production the good, or the marginal social cost. Similarly there might be two curves for the demand or benefit of the good. The social demand curve would reflect the benefit to society as a whole, while the normal demand curve reflects the benefit to consumers as individuals and is reflected as effective demand in the market. What curve is added depends on the type of externality that is described, but not whether it is positive or negative. Whenever an externality arises on the production side, there will be two supply curves (private and social cost). 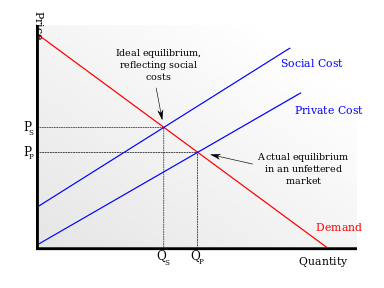 However, if the externality arises on the consumption side, there will be two demand curves instead (private and social benefit). This distinction is essential when it comes to resolving inefficiencies that are caused by externalities. The graph shows the effects of a negative externality. For example, the steel industry is assumed to be selling in a competitive market – before pollution-control laws were imposed and enforced (e.g. under laissez-faire). The marginal private cost is less than the marginal social or public cost by the amount of the external cost, i.e., the cost of air pollution and water pollution. This is represented by the vertical distance between the two supply curves. It is assumed that there are no external benefits, so that social benefit equals individual benefit. If the consumers only take into account their own private cost, they will end up at price Pp and quantity Qp, instead of the more efficient price Ps and quantity Qs. These latter reflect the idea that the marginal social benefit should equal the marginal social cost, that is that production should be increased only as long as the marginal social benefit exceeds the marginal social cost. The result is that a free market is inefficient since at the quantity Qp, the social benefit is less than the social cost, so society as a whole would be better off if the goods between Qp and Qs had not been produced. The problem is that people are buying and consuming too much steel. This discussion implies that negative externalities (such as pollution) are more than merely an ethical problem. The problem is one of the disjuncture between marginal private and social costs that is not solved by the free market. It is a problem of societal communication and coordination to balance costs and benefits. This also implies that pollution is not something solved by competitive markets. Some collective solution is needed, such as a court system to allow parties affected by the pollution to be compensated, government intervention banning or discouraging pollution, or economic incentives such as green taxes. Supply curve with external benefits; when the market does not account for additional social benefits of a good both the price for the good and the quantity produced are lower than the market could bear. The graph shows the effects of a positive or beneficial externality. For example, the industry supplying smallpox vaccinations is assumed to be selling in a competitive market. The marginal private benefit of getting the vaccination is less than the marginal social or public benefit by the amount of the external benefit (for example, society as a whole is increasingly protected from smallpox by each vaccination, including those who refuse to participate). This marginal external benefit of getting a smallpox shot is represented by the vertical distance between the two demand curves. Assume there are no external costs, so that social cost equals individual cost. If consumers only take into account their own private benefits from getting vaccinations, the market will end up at price Pp and quantity Qp as before, instead of the more efficient price Ps and quantity Qs. These latter again reflect the idea that the marginal social benefit should equal the marginal social cost, i.e., that production should be increased as long as the marginal social benefit exceeds the marginal social cost. The result in an unfettered market is inefficient since at the quantity Qp, the social benefit is greater than the societal cost, so society as a whole would be better off if more goods had been produced. The problem is that people are buying too few vaccinations. The issue of external benefits is related to that of public goods, which are goods where it is difficult if not impossible to exclude people from benefits. The production of a public good has beneficial externalities for all, or almost all, of the public. As with external costs, there is a problem here of societal communication and coordination to balance benefits and costs. This also implies that vaccination is not something solved by competitive markets. The government may have to step in with a collective solution, such as subsidizing or legally requiring vaccine use. If the government does this, the good is called a merit good. Examples include policies to accelerate the introducing of Electric vehicles or promote Bicycling which benefit Public health. Pigovian taxes or subsidies intended to redress economic injustices or imbalances. A Pigovian tax (also called Pigouvian tax, after economist Arthur C. Pigou) is a tax imposed that is equal in value to the negative externality. The result is that the market outcome would be reduced to the efficient amount. A side effect is that revenue is raised for the government, reducing the amount of distortionary taxes that the government must impose elsewhere. Governments justify the use of Pigovian taxes saying that these taxes help the market reach an efficient outcome because this tax bridges the gap between marginal social costs and marginal private costs. Some arguments against Pigovian taxes say that the tax does not account for all the transfers and regulations involved with an externality. In other words, the tax only considers the amount of externality produced. Another argument against the tax is that it does not take private property into consideration. Under the Pigovian system, one firm, for example, can be taxed more than another firm, even though the other firm is actually producing greater amounts of the negative externality. However, the most common type of solution is a tacit agreement through the political process. Governments are elected to represent citizens and to strike political compromises between various interests. Normally governments pass laws and regulations to address pollution and other types of environmental harm. These laws and regulations can take the form of "command and control" regulation (such as setting standards, targets, or process requirements), or environmental pricing reform (such as ecotaxes or other Pigovian taxes, tradable pollution permits or the creation of markets for ecological services). The second type of resolution is a purely private agreement between the parties involved. Government intervention might not always be needed. Traditional ways of life may have evolved as ways to deal with external costs and benefits. Alternatively, democratically run communities can agree to deal with these costs and benefits in an amicable way. Externalities can sometimes be resolved by agreement between the parties involved. This resolution may even come about because of the threat of government action. If all of these conditions apply, the private parties can bargain to solve the problem of externalities. This theorem would not apply to the steel industry case discussed above. For example, with a steel factory that trespasses on the lungs of a large number of individuals with pollution, it is difficult if not impossible for any one person to negotiate with the producer, and there are large transaction costs. Hence the most common approach may be to regulate the firm (by imposing limits on the amount of pollution considered "acceptable") while paying for the regulation and enforcement with taxes. The case of the vaccinations would also not satisfy the requirements of the Coase theorem. Since the potential external beneficiaries of vaccination are the people themselves, the people would have to self-organize to pay each other to be vaccinated. But such an organization that involves the entire populace would be indistinguishable from government action. In some cases, the Coase theorem is relevant. For example, if a logger is planning to clear-cut a forest in a way that has a negative impact on a nearby resort, the resort-owner and the logger could, in theory, get together to agree to a deal. For example, the resort-owner could pay the logger not to clear-cut – or could buy the forest. The most problematic situation, from Coase's perspective, occurs when the forest literally does not belong to anyone; the question of "who" owns the forest is not important, as any specific owner will have an interest in coming to an agreement with the resort owner (if such an agreement is mutually beneficial). However, the Coase theorem is difficult to implement because Coase does not offer a negotiation method. Additionally, firms could potentially bribe each other since there is little to no government interaction under the Coase theorem. For example, if one oil firm has a high pollution rate and its neighboring firm is bothered by the pollution, then the latter firm may move depending on incentives. Thus, if the oil firm were to bribe the second firm, the first oil firm would suffer no negative consequences because the government would not know about the bribing. Ecological economics criticizes the concept of externality because there is not enough system thinking and integration of different sciences in the concept. Ecological economics is founded upon the view that the neoclassical economics (NCE) assumption that environmental and community costs and benefits are mutually canceling "externalities" is not warranted. Joan Martinez Alier, for instance shows that the bulk of consumers are automatically excluded from having an impact upon the prices of commodities, as these consumers are future generations who have not been born yet. The assumptions behind future discounting, which assume that future goods will be cheaper than present goods, has been criticized by Fred Pearce and by the recent Stern Report (although the Stern report itself does employ discounting and has been criticized for this and other reasons by ecological economists such as Clive Spash). In contrast, ecological economists, like Joan Martinez-Alier, appeal to a different line of reasoning. Rather than assuming some (new) form of capitalism is the best way forward, an older ecological economic critique questions the very idea of internalizing externalities as providing some corrective to the current system. The work by Karl William Kapp explains why the concept of "externality" is a misnomer. In fact the modern business enterprise operates on the basis of shifting costs onto others as normal practice to make profits. Charles Einsentein has argued that this method of privatising profits while socialising the costs through externalities, passing the costs to the community, to the natural environment or to future generations is inherently destructive As social ecological economist Clive Spash has noted, externality theory fallaciously assumes environmental and social problems are minor aberrations in an otherwise perfectly functioning efficient economic system. Internalizing the odd externality does nothing to address the structural systemic problem and fails to recognize the all pervasive nature of these supposed 'externalities'. ↑ Buchanan, James; Wm. Craig Stubblebine (November 1962). "Externality". Economica. 29 (116): 371–84. doi:10.2307/2551386. ↑ J.J. Laffont (2008). "externalities," The New Palgrave Dictionary of Economics, 2nd Ed. Abstract. ↑ Kenneth J. Arrow (1969). "The Organization of Economic Activity: Issues Pertinent to the Choice of Market versus Non-market Allocations," in Analysis and Evaluation of Public Expenditures: The PPP System. Washington, D.C., Joint Economic Committee of Congress. PDF reprint as pp. 1–16 (press +). ↑ "Economics (McConnell), 18th Edition Chapter 16: Public Goods, Externalities, and Information Asymmetries". ↑ Mas-Colell, Andreu (1995). Microeconomic Theory. Oxford. p. 878. ISBN 0-19-507340-1. 1 2 "Microeconomics – Externalities". Retrieved 2014-11-23. ↑ Goodstein, Eban. Economics and the Environment. Wiley. p. 32. ISBN 9781118539729. ↑ Stern, Nicholas (2006). "Introduction". The Economics of Climate Change The Stern Review (PDF). Cambridge University Press. ISBN 978-0-521-70080-1. ↑ De Bandt, O.; Hartmann, P. (1998). "Risk Measurement and Systemic Risk" (PDF). Imes.boj.or.jp: 37–84. ↑ Pew Commission on Industrial Farm Animal Production. "Proc Putting Meat on The Table: Industrial Farm Animal Production in America". The Johns Hopkins Bloomberg School of Public Health. .
1 2 Buekers, J; Van Holderbeke, M; Bierkens, J; Int Panis, L (2014). "Health and environmental benefits related to electric vehicle introduction in EU countries". Transportation Research Part D Transport and Environment. 33: 26–38. doi:10.1016/j.trd.2014.09.002. 1 2 3 4 Robert H. Frank, "Are Positional Externalities Different from Other Externalities? " (draft for presentation for Why Inequality Matters: Lessons for Policy from the Economics of Happiness, Brookings Institution, Washington, D.C., June 4–5, 2003). ↑ Buekers, J (2014). "Health and environmental benefits related to electric vehicle introduction in EU countries". Transportation Research Part D Transport and Environment. 33: 26–38. ↑ Barthold, Thomas A. (1994). "Issues in the Design of Excise Tax." Journal of Economic Perspectives. 133–51. ↑ Nye, John (2008). "The Pigou Problem." The Cato Institute. 32–36. ↑ Barnett, A.H. and Yundle, Bruce. (2005). "The End of the Externality Revolution." PDF. ↑ Varian, Hal (1994). "A Solution to the Problem of Externalities When Agents Are Well Informed." The American Economic Review. Vol. 84 No. 5. ↑ Marney, G.A. (1971). "The ‘Coase Theorem:' A Reexamination." Quarterly Journal of Economics.Vol. 85 No. 4. 718–23. ↑ Costanza, Robert; Segura,Olman; Olsen, Juan Martinez-Alier (1996). Getting Down to Earth: Practical Applications of Ecological Economics. Washington, D.C.: Island Press. ISBN 1559635037. ↑ Pearce, Fred "Blueprint for a Greener Economy"
↑ "Spash, C. L. (2007) The economics of climate change impacts à la Stern: Novel and nuanced or rhetorically restricted? Ecological Economics 63(4): 706–13" (PDF). Retrieved 2012-12-23. Baumol, W. J. (1972). "On Taxation and the Control of Externalities". American Economic Review. 62 (3): 307–22. JSTOR 1803378. Caplan, Bryan (2008). "Externalities". In David R. Henderson (ed.). Concise Encyclopedia of Economics (2nd ed.). Indianapolis: Library of Economics and Liberty. ISBN 978-0865976658. OCLC 237794267. Johnson, Paul M. Definition "A Glossary of Economic Terms"
Pigou, A.C. (1920). Economics of Welfare. Macmillan and Co.
Tullock, G. (2005). Public Goods, Redistribution and Rent Seeking. Edward Elgar Publishing, Inc. ISBN 1-84376-637-X. Volokh, Alexander (2008). "Externalities". In Hamowy, Ronald. The Encyclopedia of Libertarianism. Thousand Oaks, CA: SAGE; Cato Institute. pp. 162–63. ISBN 978-1-4129-6580-4. LCCN 2008009151. OCLC 750831024. Weitzman, Martin (October 1974). "Prices vs. Quantities". The Review of Economic Studies. 41 (4): 477–91. doi:10.2307/2296698. JSTOR 2296698. Wikimedia Commons has media related to Externality.